"The purpose of a Tracking Test is to demonstrate the dog's ability to recognize and follow human scent, a skill that is useful in the service of mankind." 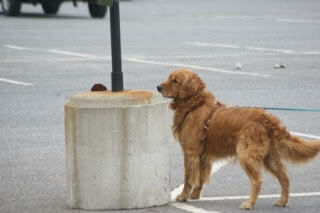 The DTCM holds one or more AKC sanctioned tracking tests each year. For specific information about our tests and other events, please consult the Events & Tests page. If you are new to the sport of dog tracking, please visit our Info page which explains the sport. The Club holds training clinics for both beginners and advance tracking dogs. We also have Tracking Judges among our membership who can test and certify the dog for the Tracking Dog Test. We typically hold monthly meetings (on our Facebook page or our Events & Tests page) that are open to the public. The Dog Tracking Club of Maine meets on a monthly basis, typically on the third Sunday of the month, with the exception of December. In the winter and spring, we meet at the Barron Center in Portland. Our annual awards banquet usually takes place in March. This is our opportunity to recognize the accomplishments of our members and enjoy dog conversation. When the weather turns better, we try to schedule some meetings outdoors with an opportunity for members to track with their dogs in the morning, followed by the meeting around noon. Our outdoor schedule depends upon the availability of fields. On those days when we have such an outing, we encourage members to bring a sandwich and enjoy lunch with the group. In August, we typically hold a cookout at a member's home. A great time to enjoy the out-of-doors with your dog. Between meetings, members try to meet with others in their area to practice and work on problems. By joining you will have an opportunity to find out who is available and where there are some fields for you to work.